Kexi usage statistics is an experiment started two years along with Kexi 2.4. The information helps to make certain decisions related to design and direction of the project. Today I'd like to show you first results. On every startup of Kexi, background job sends anonymous information to project's kexi-project.org server. User's privacy is a top priority here; users need to opt-in by enabling Share usage info option at Kexi startup. For detailed idea and plans behind the effort, click the "?" mark in the startup window, here's a copy of the text. Naturally, the raw data is never presented online. Basic info. Enabling this will include your usage of Kexi in the global statistics. It contains anonymous identification number (must-have for tracking number of unique users), Kexi version, KDE version, operating system name. System and hardware info. Enabling this helps the Kexi Project to identify typical operating systems and hardware that should be supported. It contains Linux operating system distributor, description, release, version, and machine type. Screen information. Enabling this helps Kexi Project to better know real display parameters used with Kexi, so it can be better optimized. Regional settings. 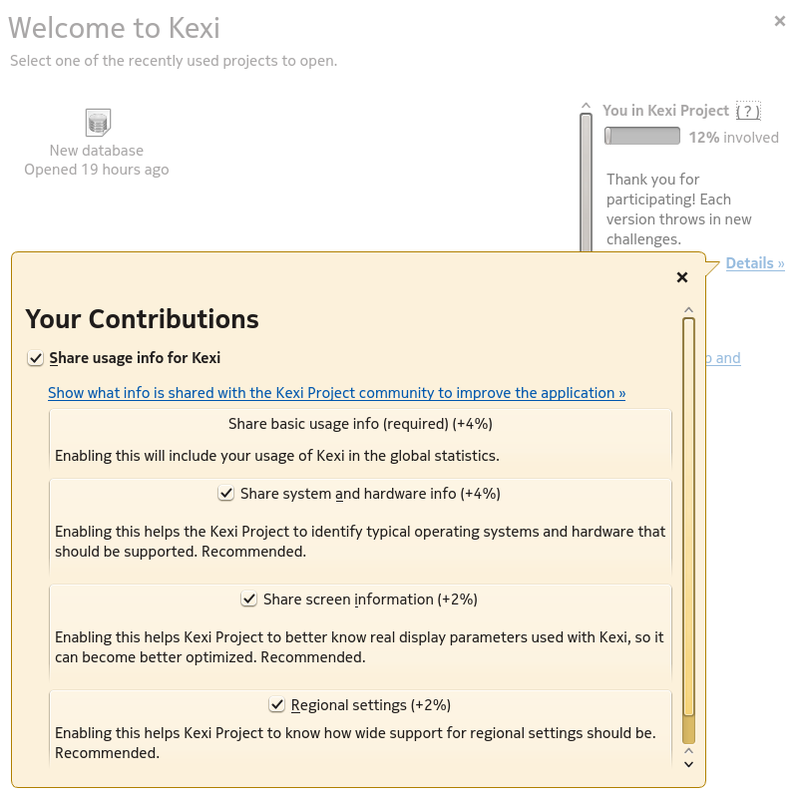 Enabling this helps Kexi Project to know how wide support for regional settings should be. It contains user's language, country, date and time formats, and usage of right-to-left layout. It remains to be seen what would the results look like for the rest of Calligra and for KDE apps in general. Naturally, the data only include people that agreed to support the user feedback program, so real data would look completely different. If you have questions or would like to join the experiment with other apps please leave a word in the comments below. And if you use Kexi, and have not the enabled the feedback feature, please consider taking this easy step. Could you please provide the total number of users (rather than just percentage figures). That'd probably give more meaning and perspective. Not every user has unique id: this feature has been introduced in the meantime. Also, people could use multiple accounts/installations (the id is randomply generated if not found in kexirc file). I'll be happy to report realistic data when we get support for real user accounts, probably merged with http://identity.kde.org, via openID or so. Actually, I thought these numbers are about usage, ie. in hours & minutes? > accounts, probably merged with http://identity.kde.org, via openID or so. How would you keep the privacy then? Using real accounts will be optional. I just do not see a need for creating separate account system specifically for Kexi (but it could be done of course to get a fallback option). External accounts do not need to carry any personal data, right? However, I do not get the percentages (2, 3 4% etc. ), also they do not add up to 100% ? As of apps, the (whole) Calligra suite is the first that comes to my mind. Sometimes the numbers are rounded, so you see 0% instead of, say 0.3%, but you get the idea, and the charts show real relations. As for the first chart, it shows percentage relation to the average value (set as 100%). It's good idea to see the experiment ending up globally in KDE so users can give valuable feedback from one central place without distractions.